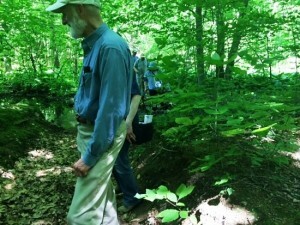 Truman Sherk (pictured), has been hiking the Branford trails for almost 45 years. Since he first started exploring, the trails have evolved and expanded as the Branford Land Trust (BLT) has continued to work with the town and other conservation groups to acquire open spaces. “I used to walk the trails when I was at my grandparents’ house around here,” Sherk said. Since then, he has helped to lead various walks around the Supply Pond. When guiding a group, he recommends hiking the hardest parts first.